Until this point, hardware and software were distributed as a single product, and indeed software was not officially recognised as a protectable subject-matter in the USA until 1980 (being unfixed and intangible). Nonetheless, the task force believed copyright was a viable, if potentially weak, form of protection for this new separated software. The most significant weakness was present in the form of exhaustion through “sales” of that software, representing a particular vulnerability in the unbundling process. This resulted in the creation of a contractual mechanism to ensure that IBM users would be licensees of software only (and categorically not owners). With the kind assistance of IBM’s Business Archives (and archivist Max Campbell), I have sought to identify this document. Dated 1969 (surprisingly early given that mass-home computing only took off during the 1980s) this “License Agreement” was designed to protect “Program Products” (e.g. software). Of most note, and the aspect which particularly shows the age of the document (given that most users nowadays will not read any terms and conditions in detail), a signature was required by the customer, to be co-signed by IBM on return. Many hallmarks of software exceptions as we understand them today are also present: users are permitted to make copies of the software as back-ups; reverse engineering is permitted for users who wish to understand the inner workings of the software’s contents, and; the software can be modified or “merged” to make an “updated work” (a type of adaptation/transformative work). Humphrey also recalls in the memoir how the task force specifically decided against the implementation of what we would now consider TPMs/DRMs (e.g. cryptography of single-machine locks) describing them as “inconvenient for users and expensive for IBM”. This is in stark contrast to how we understand commercially-owned software today. The potential implications of this document (and the story behind it, if it is indeed the first of its kind) are exciting; certainly, it seems that this type of contractual mechanism was born primarily because of an absence of copyright protection, and the fear associated with this. Whether such a mechanism remains appropriate is a matter for further research. Also worth noting are the parallels between the types of uses permitted by the licence agreement and the subsequent law in fair use and copyright exceptions for software. This suggests that software firms both anticipated and accounted for the types of uses which are now permitted by law. It appears that the concept of a user (at least for software) was firstly conceived by private firms as opposed to hard law. 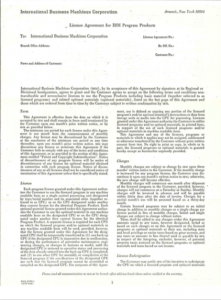 The 1969 Licence Agreement for IBM Program Products is available for download here, with the courtesy of International Business Machines Corporation, © (1969) International Business Machines Corporation. For more information on private ordering and copyright, see CREATe working papers by Paul L.C. Torremans ’The Future Implications of the Usedsoft Decision’ (2014) and Edina Harbinja ‘Virtual worlds players – consumers or citizens?’ (2014).